It's important to remember that the NFL's initial reaction to Ray Rice cold-cocking Janay Palmer, now Janay Rice, was a mild two-game suspension. The Ravens even sent out a tweet where Palmer took part of the blame for her own unconsciousness! If you want to know why this was allowed to stand for so long see Republican Ben Carson's apologist statement for Ray Rice, which perfectly represents the NFL's dereliction in this tale of domestic violence. It wasn't until the public saw the raw video footage that NFL commissioner Roger Goodell and the Ravens took the situation seriously. The reaction of Janay Palmer (Rice) the day after sends a chilling signal to women who make excuses for their abusers instead of fleeing the scene, walking away from the relationship that's built on extremes of emotion that has no relationship to love she is claiming exists. The outcome leaves Janay Palmer (Rice) in an even worse situation, because now her husband has lost his livelihood in the NFL and at some point the furor will die down leaving her vulnerable again. Juliet Macur, a writer for the New York Times, wrote a terrific piece emphasizing that it took a video to make the public react, because the facts of the case, known long ago, weren't enough. That alone should have been enough for the N.F.L. to suspend Rice for a good, long time, or for the Ravens to get rid of him. It should have prompted the league to send a message to other players -- as well as to its fans -- that domestic violence will not be tolerated. But Rice was a star, and excuses are made for stars. If you don't understand how Ray Rice was allowed to initially escape prosecution, accepting a much lesser punishment of therapy from the court, nothing illustrates the culture of protecting the abusers of women better than Republican Ben Carson's statement on behalf of Ray Rice. "And let's not all jump on the bandwagon of demonizing this guy," Carson continued. "He obviously has some real problems, and his wife obviously knows that, because she subsequently married him. So they both need some help. So rather than just jumping on a punitive bandwagon, let's just see if we can get some help for these people." Ben Carson is an example of how domestic abuse comes to be ignored, but also why the NFL was so nonchalant about the violent assault. The behavior stays inside homes, the woman grasping for love by trying to protect a man whose violence threatens her life every day she stays within his orbit. Janay Palmer is dangerously delusional, because Ray Rice's contrition through public humiliation that resulted in his ouster from the Raven's and indefinite NFL suspension came only because he was trying to save his precious high profile NFL career. It wasn't voluntary, understanding what he'd done. It was to save face after his cowardice was exposed. 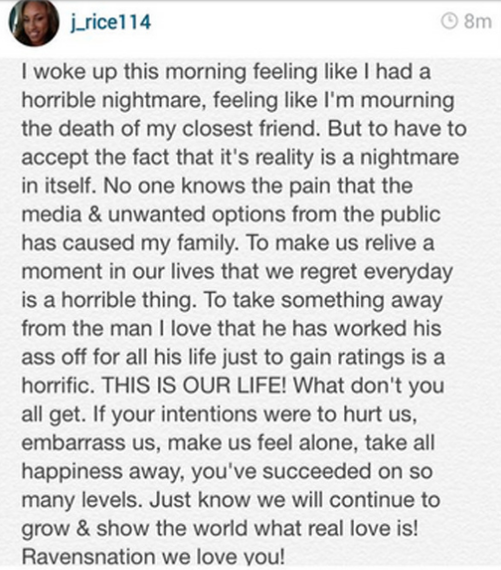 Mrs. Janay Rice's attack on the media via Instagram is alarming and so tragically sad. Writing in terms of "we regret" ignoring facts we all now know. Trying to protect and defend the man who knocked her unconscious and whom she married after the assault. Janay Palmer is in denial and as long as she cannot blame her husband directly for his violence, her husband admitting he is in a behavior cycle that requires treatment separate from her, she will remain in danger. 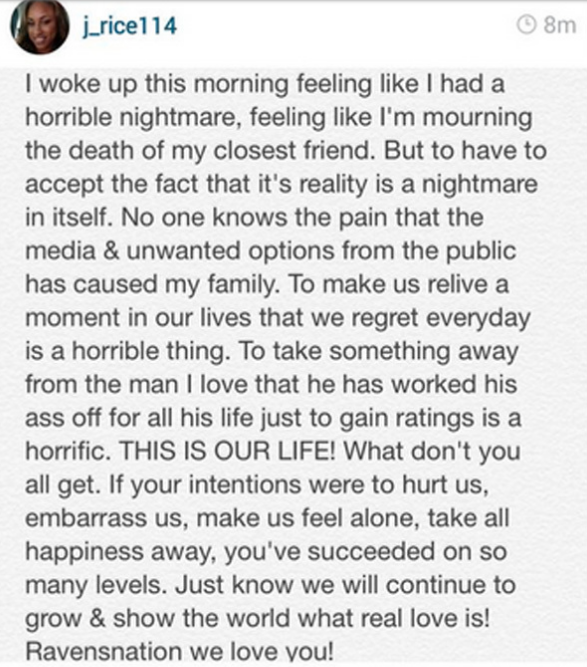 That Janay Palmer has become her husband's champion, while making him the victim as she blames outside forces should send a chill down the collective American culture that ignores domestic violence every day, which is seen through Ben Carson's statement on behalf of Ray Rice that just as easily could have initially come from the Ravens or NFL commissioner Roger Goodell. Taylor Marsh is the author of the new book The Sexual Education of a Beauty Queen - Relationship Secrets From the Trenches. Meet Taylor at the regional Baltimore Book Festival this month.